This is part two of a four part series about pay requirements. In this series we are exploring the pay requirements of employers and what can happen if those requirements and regulations are not met. Part one of this series covers the five main pillars of employee compensation. To read part one, click here. In this article we will examine more closely one of the two different classifications of employees, as mentioned in the previous article; non-exempt employees. Non-exempt employees, sometimes also called hourly employees, must be paid no less than the federal minimum wage for each hour worked. The term “non-exempt” implies that they are not exempt from overtime pay and other requirements of the Fair Labor Standards Act (FLSA), which governs federal employment standards. As mentioned in the previous article, non-exempt employees are subject to a number of factors that influence what and how they are paid. Here are some of the most significant non-exempt wage influencers that employers should be aware of. Non-exempt employees must be paid at least the federal minimum wage for each hour of work they perform. However, some states have a minimum wage that is higher than the federal minimum. Currently, 29 states and the District of Columbia have a minimum wage that is above the federal minimum wage. In California, for example, the minimum wage currently sits at $11.00 per hour, while the federal minimum wage is only $7.25. Non-exempt employees that perform work in these states may not be paid less than the state minimum wage for each hour worked. Similar to the above scenario, local ordinances take precedence over state or federal minimum wage requirements. For example, in San Francisco, the minimum wage is higher than the state minimum, recently reaching $15.00 per hour in July of this year. Employees who work for more than two hours in an area with a local ordinance are eligible to receive the minimum wage of that area and must be paid accordingly. Non-exempt employees must receive overtime pay for all hours worked beyond 40 hours in a work week. In California, employees are eligible for overtime pay when they work more than eight hours in one day. Under California law, non-exempt employees must be paid a daily overtime rate of one-and-a-half times the employee's regular rate of pay for all hours worked in excess of 8 hours, up to and including 12 hours in any workday, and for the first 8 hours worked on the seventh consecutive day of work in a workweek. The FLSA does not require additional overtime pay for work done on weekends, holidays, or regular days of rest, only requiring it if overtime is worked on those days. Some employers may opt to pay their employees on a per unit basis for each project completed rather than paying an hourly rate. Employers who do this must still comply with minimum wage, overtime and record keeping requirements under state and federal law. While this may be easily done in many states, California law makes the piece rate pay system slightly more complicated. In addition to requiring that the piece rate compensation complies with minimum wage requirements, under the law, employers must pay employees for rest and recovery periods and “other non-productive time” at an hourly rate that is not less than the applicable minimum wage. 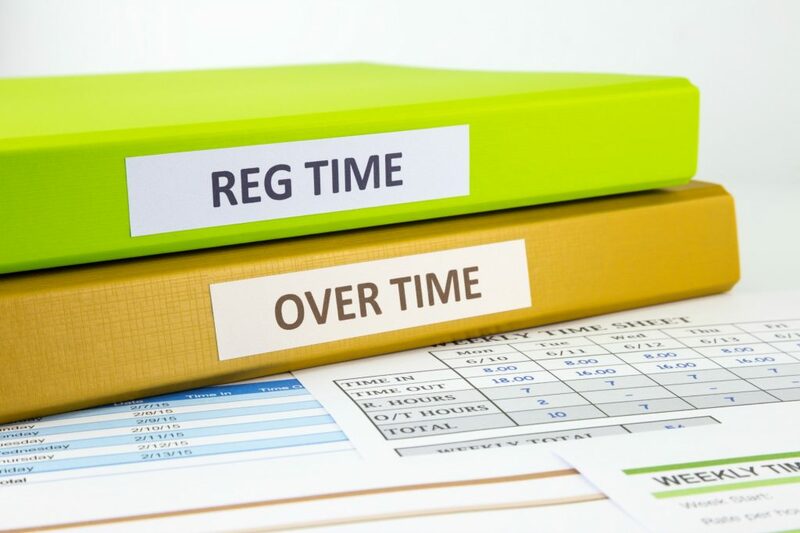 Employers can determine the amount of an employee’s other nonproductive time either through actual records or the employer’s reasonable estimates for each pay period. Non-exempt employees are eligible for a split-shift premium under certain conditions: Their work schedule includes a block of unpaid time of more than one hour that is not a meal period; the block of unpaid time interrupts two work periods; or the total wages earned do not exceed the applicable minimum wage for all hours worked, plus one additional hour. If any of these conditions are met, the employee may be entitled to an additional one hour of pay at the minimum wage rate. The idea behind this requirement is that an employee is not truly free of duty between two shifts that occur within the same work day, so an additional payment helps compensate them for their time. However, if the employee makes more than the minimum wage, their wages may offset the need for a split-shift premium altogether. Reporting time pay is due to an employee if they report to work at their regularly scheduled time, but are sent home for lack of work or other factors outside of their control. The employer must pay that employee for at least one-half of their scheduled shift, at the regular rate. Reporting time pay should be no less than two hours of pay and no more than four. In some situations, employers may be exempt from paying reporting time pay, such as in the event of a public utilities failure or a natural disaster, both of which are beyond the employer’s control. There are two types of standby status that are examined to determine whether or not an on-call employee is entitled for on-call pay. In a controlled standby, the employee’s time is so restricted that they are unable to pursue personal activities or come and go as they please, so the employer is considered to have direction and control of the employee during this time. In controlled standby, the employee is entitled to compensation of at least an hourly minimum wage. If the employee is able to use their time as they please with no restrictions while being on-call, this is known as uncontrolled standby, and requires no additional compensation. In some cases, non-exempt employees may be eligible for expense reimbursement for certain work-related expenses. These can vary on a state-by-state basis. In accordance with California Labor Code, an employee is entitled to be reimbursed by his or her employer "for all necessary expenditures or losses incurred by the employee in direct consequence of the discharge of his or her duties, or of his or her obedience to the directions of the employer." This means that California employees have the right to be reimbursed for business-related expenses, such as equipment, supplies, training, business travel, uniforms and, in some cases, cell phones. In addition, California employers must maintain all records relating to employees' requests for expense reimbursements for a period of three years.